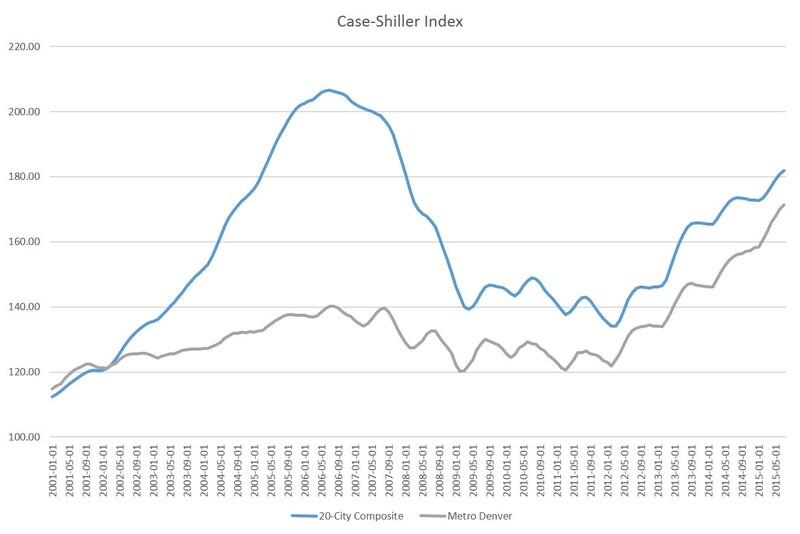 While the trend has clearly been upward in recent years, we are now seeing that a plateau has been hit in both the Denver metro area and in the composite index. Of course, the metro Denver plateau around ten percent points to continued strong gains in prices, and is a reason for current homowners and landlords to be happy. first time homebuyers, on the other hand, have less reason to be happy. At the national level, though, the composite index suggests more of a cooling in the market. Growth rates are clearly down from where they were back in 2013, and outside of Denver and San Francisco, price growth has moderated throughout many of the cities covered in the index. Index growth is now flat around 5 percent, and has been so since last September. With interest rates at historic lows, this further suggests an inflexibility in the market that refuses to take off in spite of high accomodative monetary policy. In Denver, however, in-migration continues to drive strong price increases, though. 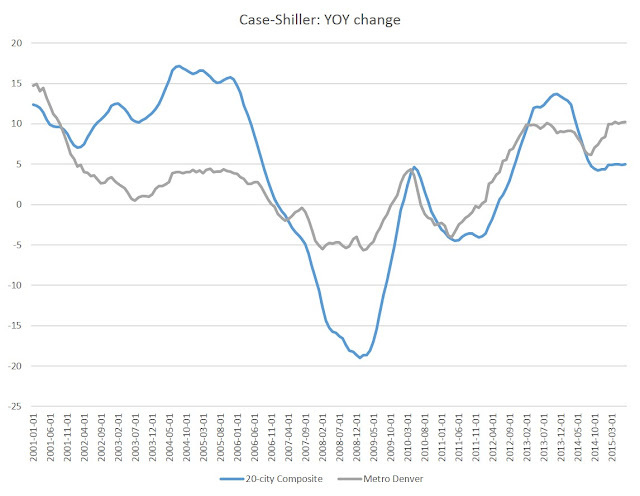 The second graph compares the rate growth of the composite index and the Denver index. Denver is clearly outpacing the nation overall. Note also that the 2-city composite index is still below its former peak level. July 2015's index number was still 11.9 percent below the peak level, reached during July 2006. Metro Denver's July value, however, was well above its former peak and is at an all-time high. 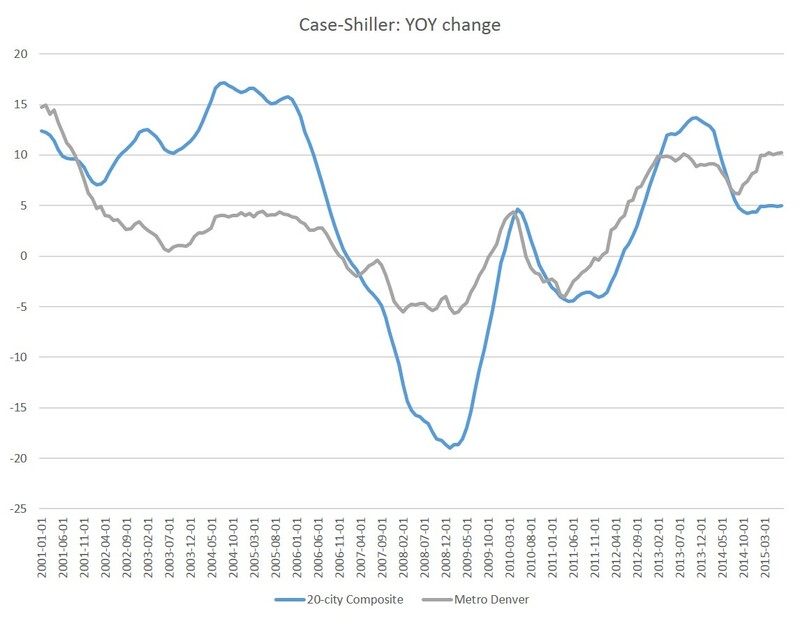 During July, the metro Denver index was 22.1 percent above the 2006 peak achieved during August 2006.